The German Base Yavin at FEDCON - look forward to fandom action! The German Base Yavin is the German subgroup of the worldwide represented Star Wars costume fan club “Rebel Legion”. Here you will only find costumes of the light side of the Force, the “good side” like the Jedi, senators, the rebels and of course the heroes of the saga: e.g. Chewbacca, Han Solo, Luke Skywalker, Leia Organa or Rey. At the German Base Yavin you can get a lot of interesting information about the community as well as free photos with the GBY members in their great costumes. 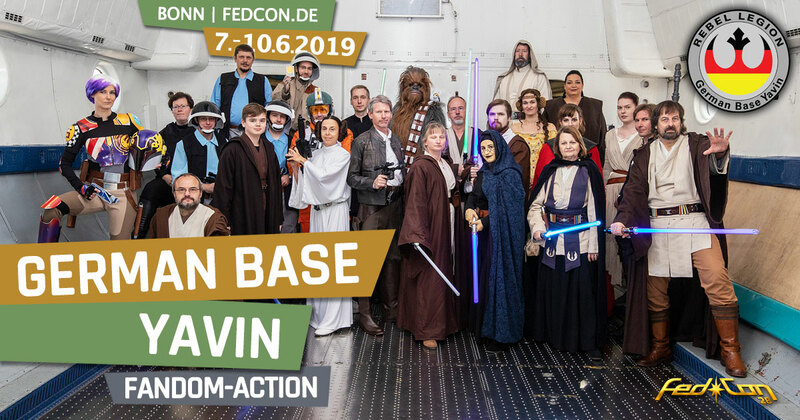 And also for a good cause, the numerous members of the German Base Yavin 2019 will be back at FedCon 28. Look forward to games at the booth of the costume club, in which you can actively participate for a small donation. The proceeds of this campaign will be donated to Sea Shepherd, an organization dedicated to the protection of marine life. And besides, there are also “powerful” prizes to win! Further activities (e.g. exciting lectures) and surprises are planned. So it is definitely worth it to visit the booth of the German Base Yavin at FedCon 28 … or maybe to become an active member.